My movie bingeing on Netflix continues. And inspired by the rush of blogging that is happening everywhere I have decided to kill two birds with one stone. So, here is my review for an offbeat Bollywood romantic comedy by the name of Qarib Qarib Singlle directed by Tanuja Chandra. I say 'offbeat' only because it does not conform to the escapist, fantasy fare that Bollywood romances usually are. In fact, the strength of QQS is that it is rooted in reality and its characters are the average everyday people you would meet. The protagonist Jaya is a single career woman whose soldier husband is no more. She is constantly being egged on by friends to start dating and shed her single status. She finally puts up her profile on an online dating site and is inundated with lewd messages from weirdos. But one message catches her eye. From a poet named Yogi. Jaya is amused and slightly bewildered by a man who insists on telling her about his ex-girlfriends on their first date. Yogi turns out to be a charming and eccentric character and she finds herself going on a road trip with him, ostensibly to meet his exes. Charming, quirky incidents follow and through it all the poles-apart Jaya and Yogi fall in love with each other. 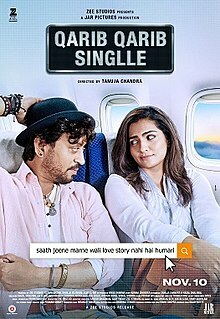 While it was watchable -- thanks mainly to stellar performances by Irrfan Khan and Parvathy -- I'm confused as to why exactly Jaya would agree to go on a road trip with a man she has just met and that too to meet his ex girlfriends! There is a lame effort to explain this, in the third act of the film, but it comes too late and doesn't quite work. Have you seen the film? Do share your thoughts in the comment box below. Will try to watch this movie. Seems a good one. 2010 is starting off to be a good year for movie buffs. This is a great solarmovies.co on my list you definitely have to take the kids to go see it. Thanks a lot for sharing us about this update. Hope you will not getall movies online full movies tired on making posts as informative as this. Movie Review writing is easy. There are a few points that have to be kept in mind to be a successful https://freenetflixacc2019.weebly.com/ critic. And one has to be honest about what they are writing.